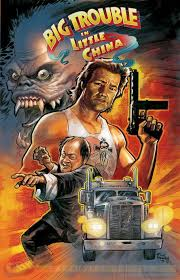 When I looked at the preview for Big Trouble #1, I already had faith the writing would be there with John Carpenter co-plotting with writer Eric Powell but I had no idea what direction the art would take. I was underwhelmed at first. I had no expectations but seeing the cartoonish style, it really didn't work for me. However I had pre-ordered the issue so bought and read it and I'm coming around on it. The writing is spot on, with Carpenter and Powell working together this feels like a nutural sequel to the movie. The attitude is there, the characterization is there, the action is there. The art, although it is still too cartoony for me, it does kind of fit. As I read the book the art started to grow on me but I'm not completely fond of it. That said the story takes place after the movie. Jack discovers his stowaway who ends becoming a sidekick pet of sorts that jacks names Frank. Jack and Frank attend Wang and Miao's wedding. Qiang Wu crashes the wedding seeking revenge for the death of his master, Lo pan. Qiang takes Wang and Miao as his hostages and orders jack to retrieve the Spirits of the Three Storms for Qiang and in return he will release Wang and Miao. I'm going to keep reading this for now, any fan of the movie might want to check it, it was good fun. Is that a hint, hint for me lol? I do love this movie and may yet check it out. Health, Comics, Gaming and 80's Television.